This is one of the most simplistic and elegant way for anyone to class up they john. Whether it's already smelling of the most expensive African Lillie's, elegant, or has empty forehead-crushed beer cans and cigar butts lying about, this will do it! It's not expensive. But, this is nice. It's something that I had never contemplated before. 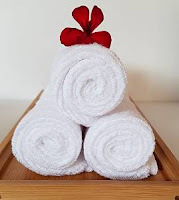 Rolled up, white washcloths on a short-lipped bamboo tray. Very nice. When you get down to your last cloth, simply lay it over, halved. It will be ready for some cleanin'. It seems to ask, Would you like a hand towel with that? When coupon code junejuly is used, 10% will be discounted off of the introductory price! This code is valid until July 31st.